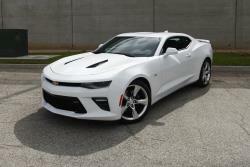 The Chevrolet Camaro SS is one of the most iconic muscle cars ever to emerge from Detroit. The all new sixth generation of Chevy’s pony car launched in 2016, and the top-spec SS version got a brand new 5th generation of the legendary Chevy LT1 6.2L V8. This nuclear power station received a host of modern features that are aimed at improving performance, without sacrificing efficiency. Put your right foot down, and you will have a massive 455 lb-ft of torque pushing you off the line, while an equally heady 455 horsepower propels you to 60 mph in about 4 seconds dead. But if that isn’t quite enough pony power for you, then it may be time to uncork that 6.2L LT1 with an AIRAID MXP performance intake system. In order to turn gasoline into tire smoke, many things have to happen. First of all, the cam-driven direct injection fuel pump has to maintain pressure at 2,175 psi, so the special piezo injectors can mist fuel directly into the cylinders at precisely the right moment. Air is then pumped in from outside the engine compartment, through the stock Camaro SS intake system. It utilizes a thick paper air filter to remove impurities from the air, before funneling it down a narrow plastic tube to the cylinders. The oxygen content of the air charge directly affects the amount of power the Chevy LT1 6.2L can make. If the air heats up due to turbulence or airflow restrictions, then a number of oxygen molecules will be reduced, which means the maximum amount of energy/horsepower can’t be released during detonation. Eliminating airflow restrictions is the simplest way to increase horsepower, without modifying the engine. To do this, the AIRAID 250-333C and 251-333C MXP performance intakes use a number of high-flow components, like lightweight carbon fiber intake tubes that have been aerodynamically designed to allow air to flow through to the motor, without swirling around and heating up. That is connected to a roto-molded air box that allows air to flow into the low restriction AIRAID performance air filter, while the unique carbon fiber lid keeps warm engine air from entering the system. The result is a higher concentration of oxygen molecules in the air charge, which allows the Chevrolet 6.2L LT1 to burn the fuel at a higher temperature, releasing more energy/horsepower, without making any engine modifications. By providing a more streamlined way for air to reach those giant 2.13 inch intake valves, both the AIRAID 250-333C and 251-333C MXP intake systems will give your 2016-2017 Chevrolet Camaro SS an estimated increase of 20.37 horsepower and 21.91 lb-ft of torque. With an airflow path that’s been redesigned to handle more air, it’s time to get that air into the system. To do this, an oversized AIRAID performance air filter is attached to a velocity stack that has been specially engineered to reduce the turbulence of the incoming air charge. You then have a choice of what type of filter you want to use. The AIRAID 250-333C MXP performance intake comes with a SynthaFlow air filter, which is constructed of oiled cotton gauze, with a synthetic inner layer. This high-flow air filter is ideally suited for dry, dusty conditions, and the ‘depth loading’ material won’t need cleaning for 30,000-50,000 miles (depending on driving conditions). The AIRAID 251-333C MXP intake system uses a SynthaMax performance air filter, which is made from a dual-layer synthetic material that never needs to be oiled. It’s designed for everyday street use, and like the AIRAID SynthaFlow filter, the reusable SynthaMax air filter only needs to be cleaned 30,000-50,000 miles (depending on driving conditions). Both low restriction filters offer superior filtration and engine protection. 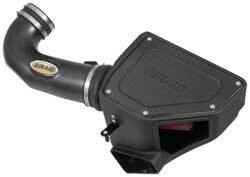 Plus, each of these Chevy Camaro SS cold air intake systems are backed by the AIRAID Lifetime Limited warranty.